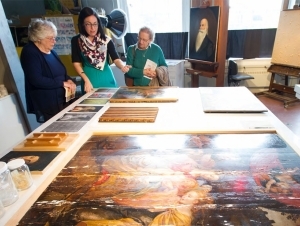 Everyone has the chance to see behind the scenes of Buffalo State’s Art Conservation Department during its fall open house on Saturday, October 17, from 11:00 a.m. to 2:00 p.m. in Rockwell Hall. It is open to the public and reservations are not required. “Our annual open house provides an opportunity for visitors who are curious about what art conservators do. They can ask question of our professors and talk to students about their projects,” said Patrick Ravines, associate professor and director of the art conservation program, one of only three graduate programs of its kind in the country. It admits just 10 students each year. He noted the open house will be held on a Saturday for the first time, rather than the Friday night spot in the past, which should be more convenient for those wishing to visit the department. The open house will be held in the newly renovated third floor space—6,434 square-feet that includes new laboratories, studios, and a conservation library—in addition to the second floor where paintings and objects conversation studios are located. Although the art conservation program was founded in 1970 at the State University of New York College at Oneonta, Cooperstown, and moved to Buffalo State in 1987, some Buffalonians are still not familiar with the program. But year after year, the department has been quietly educating the country’s future art conservators who end up working in major institutions, including the Smithsonian Institute, the National Gallery of Art, the Library of Congress, the Metropolitan Museum of Art, and the Museum of Modern Art in New York. Jonathan Thornton, professor of conservation of historic and artistic objects, recently appeared in the Buffalo News discussing his assessment of seven silk historic victory banners that members of the West Side Rowing Club brought to the annual Art Conservation Clinic on Friday, September 25. Unfortunately, the banners, which were badly damaged in a fire 40 years ago, posed a bigger job than what Thornton’s students could accept for conservation treatment. However, he referred the club members to two alumni who have turned banner conservation treatments into a specialty. The clinic saw approximately 50 visitors who made reservations to have their historic and artistic works evaluated for conservation treatment. Of those, the department was able to accept eight art objects, 17 paper-based artworks, and 17 paintings. For more information on the open house, call (716) 878-5025 or check the department website.